A great way to expand your Dolls House by adding extension buildings. Start with the Stratfield Cottage and then add the Stratfield extension. Add the Kew Cottage or the Kew Shop to the other side. Or add the Kew Cottage and the Kew Shop one either side. Or add the Stratfield Cottage to the side of a larger dolls house. Stratfield Cottage 4 rooms, false stair, hinged front. Sizes are 27" (69cm) high x 18" (46cm) wide x 15" (38cm) deep room sizes 10" x 12" 7" x 12" (25cm x 30cm-- 17cm x 30cm) ceiling heights 8 1/2" & 7 1/4 (21cm & 17cm). Stratfield Extension 2 rooms, hinged front and roof. Side windows and side door if in photo are not included in with the kit , but can be ordered if required. Can be added to the side of any make of dolls house to add more room. 24" (60cm) high x 10 1/2" (27cm) wide x 11 (28cm) deep. Rooms sizes 9 1/2" wide x 10" deep (24cm x 25cm). Kew Cottage & Kew Shop 2 rooms, hinged front and roof with dormer window. Can be added to any make of dolls house or looks great on its own. 21" (53cm) high x 14" (36cn) wide x 13 1/4 (34cm) deep. Room size 13 1/2" wide x 10 1/4" deep (34cm x 26cm). MADE IN WALES BY DHD Dolls House Direct. All Our Houses are made by us using up todate CNC machinery and are strongly built. DHD dolls house direct aim to supply top quality miniatures accurately scaled to 1/12. Our British made dolls house food items look just like the real thing. Our own range of Houses / Shops are all inspired by real buildings. The Largest Dolls House Maker in the UK over 60 different designs. Most made in both scales 12th and 24th. Established 1989 entering our 29th year. 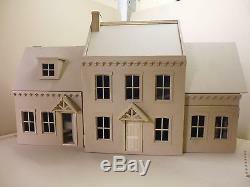 The item "1/12 Dolls House Stratfield Range & Kew Range Kit By Dolls House Direct" is in sale since Tuesday, March 18, 2014. This item is in the category "Dolls & Bears\Dolls' Miniatures & Houses\Dolls' Houses". The seller is "dolls-house-direct" and is located in Velindre, Carmarthenshire. This item can be shipped worldwide.